Hi. 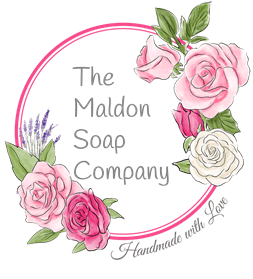 My name’s Sue McKenna and I’m the owner and creator of The Maldon Soap Company. I’ve always had very sensitive skin and always had trouble finding products that suited my skin and didn’t make my face turn red and swell up like a rather unappetising strawberry. I’ve always tried to use skincare brands that were natural (as I thought). However, through extensive trial and much error I’ve since discovered that the word ‘natural’ is often used as a marketing tool and banded about to make us think that things are more ‘natural’ than they actually are. Very often products that we think are good for us actually aren’t very good at all. Another thing I’ve discovered is that the price of something doesn’t necessarily ensure the quality and effectiveness of a skincare product. Price usually has more to do with branding and perceived value. ie. if something is really expensive it must be good for you. This I have found is simply not true. 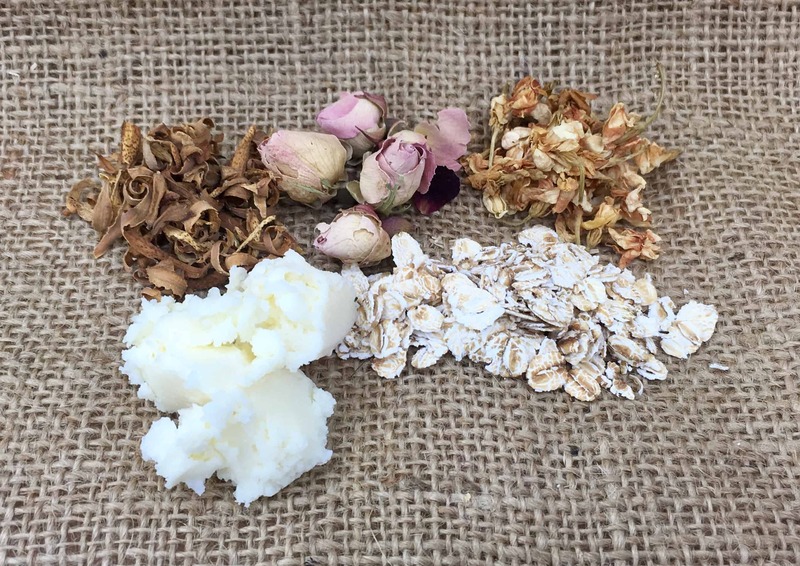 After trying for years to find soaps and skincare products for myself that were as close to nature, additive free, cruelty free and suitable for sensitive skin as possible I decided to go back to basics and make my own! As an aromatherapist with a background in the beauty industry that’s not quite as crazy as it may seem! After the initial excitement of making my first batch of soap – in a bog orange bucket in the kitchen whilst wearing a mask, goggles and gloves (not sure what I was expecting on that day in January 2013)! The soaps I made initially were a little ‘rustic’ looking but they worked a treat and my family and friends were delighted with the results. I then decided that I only ever wanted to use the best quality ingredients possible and that I wanted to use local ingredients whenever I could to keep the ‘soap miles’ down and to ensure that any money I spent stayed in the local community. When local ingredients were not available I wanted them to be sourced organically and ethically. I have never used palm oil of any kind. The butters I use are always organic, fairly traded and ethically sourced. 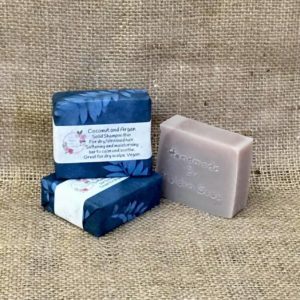 After doing lots of research and learning loads I discovered that it’s actually pretty straightforward to make soaps and skincare products without using any cheap and nasty artificial ingredients such as parabens, SLS, palm oil, mineral based additives or artificial fillers and stabilisers. I never started out using those ingredients so I don’t know any other way of making them and I never intend to find out! I have written a blog about these additives which you may be interested in. You can view it here. Once I’d had my products, formulas and ingredients safety assessed and tested I was able to begin selling them in the Maeldune Heritage Centre where I was working at the time. I’m still selling them there 6 years later! 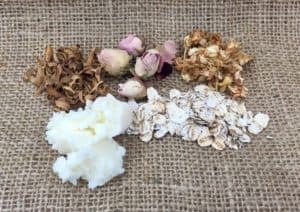 In the same way that a good chef chooses local ingredients to make simple dishes that taste incredible I like to concentrate on making the purest soaps and beauty products from the best quality but most simple ingredients possible, ensuring that they are the most beneficial products for your skin. Just don’t eat them! Skin is the largest organ of our bodies. Everything that goes on your skin or hair reaches your blood stream within approx 20 minutes, so it deserves to be kept free from unnecessary additives. Our bodies are subjected to enough air born rubbish in our daily lives so it makes sense to limit what we rub on it or sit in voluntarily. Nature works, so we should let it! 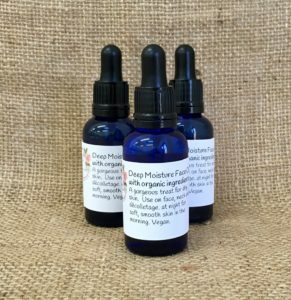 All my products are made in small batches by me to ensure that you get fresh, top quality products, so for this reason products may, occasionally, be out of stock on the website, but do keep checking back because it is updated every day as and when they are cured. Most of my customers will agree that they are worth waiting for. The vast majority of my products are vegan. For every non vegan product there is a vegan alternative. I only use two non vegan ingredients – local beeswax and local honey from a local bee keeper who is very good to his bees. Only one soap out of the 30 or so I make is not vegan. Local lavender essential oil from Hitchin. What about colour and fragrance? When colouring my products I mainly use natural colours from clays and oils which usually have a function beyond just the colour. I also use herbs, spices and vegetable colours. 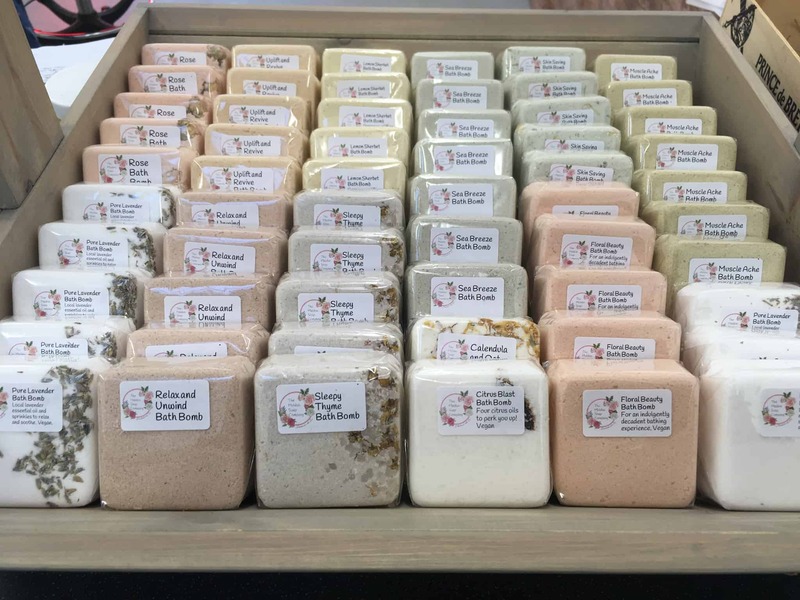 I use tiny amounts of cosmetic grade colours in two of my artisan soap collections. I prefer to keep the colour of my products subtle and understated as befits their natural ingredients. I wouldn’t want the appearance of a product to detract from its quality and functionality. I always focus on the ingredients in each product and what it does for your skin and wellbeing, rather than how brightly coloured it is. Vivid, garish colours and glitter are never natural so you won’t see any psychedelic coloured sparkly products in my range. As I’ve said before what goes on your skin soon ends up in your bloodstream – and then in the sea – so, to me, it makes sense not to sit in a bath full of brightly coloured, glitter filled water. Even if it’s a non-toxic colour and ‘eco’ glitter I can’t work out why you’d want to subject your skin to it! The majority of my products are suitable for sensitive skin. I’ve made them all so I can use them and I suffer from eczema and lots of other silly skin conditions so I have to be quite careful. I use pure essential oils to fragrance most of the products although some, which are for very sensitive skin, I have left unfragranced. I also use a couple of cosmetic grade fragrance oils such as rose and coconut which I use in small quantaties. 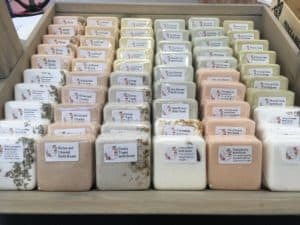 What do I use to package Maldon Soap? All the products are handmade from scratch, hand potted, labelled and wrapped by me. My cold process soaps are wrapped in Himalayan lokta paper which is a sustainable, tree free paper which supports a paper making tradition going back generations. 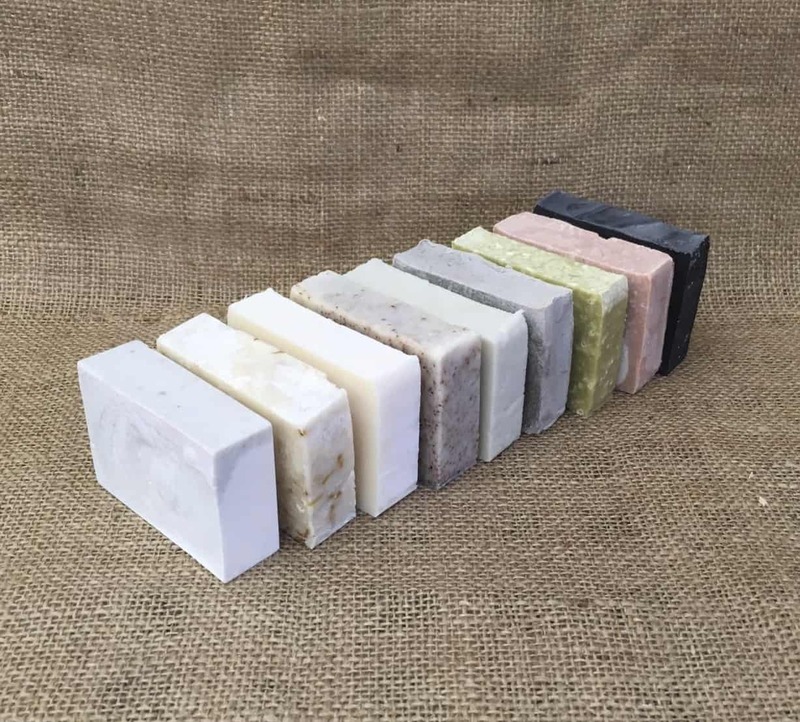 Its gorgeous paper, fully compostable and gives my soap a unique and very sophisticated look. I know it’s what’s inside that counts but people do buy with their eyes too and my soaps are very eye catching! My other soaps, solid products and bath bombs are wrapped in natural compostable cellophane. This cellophane is made in the UK from off cuts of wood which are a by product of the furniture industry. It protects the products from damage and ensures that it reaches you in the same condition that it left the studio. 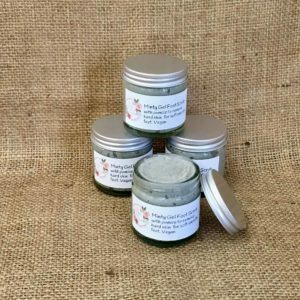 All my full size skincare products are now packaged and sold in either glass jars with aluminium lids or aluminium tins. My use of plastic for packaging is now at a minimum thankfully. Where do I make Maldon Soap? I initially made the products at home, the ultimate cottage industry. However, this soon became impractical as the business grew. 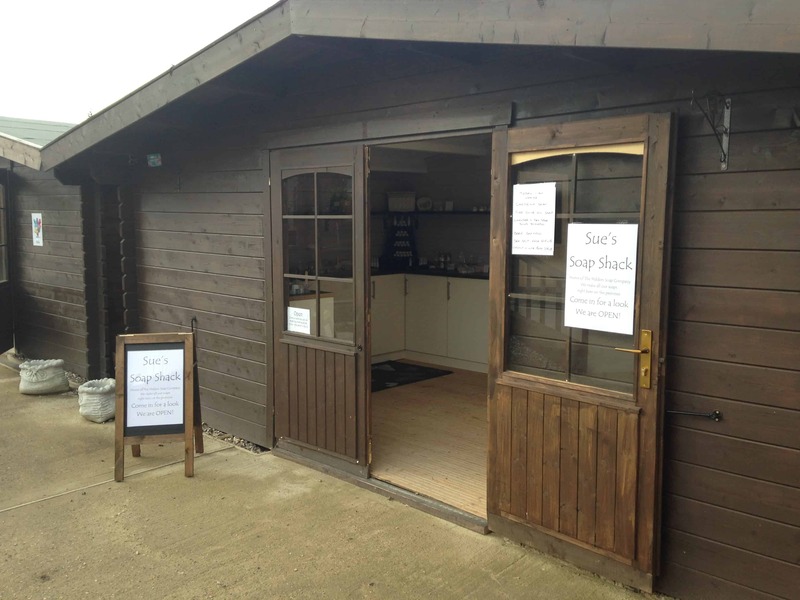 In 2014 I managed to open my own little shop (the soap shack) at White Elm Garden Centre. It doubled as a my workshop and allowed me to move the making from my home but it wasn’t very practical. It could reach 40 degrees in summer and 1 degree in winter so there were many weeks when I was unable to work in there due to the weather. Also, due to my expanding range I quickly outgrew it. 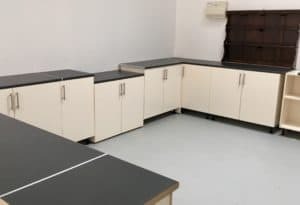 At one point whilst there I had 9 outlets across Essex as well as the website which was hard to maintain whilst working in the shop 4 days a week and making the stock too. Something had to change so in July 2017 I moved from the soap shack to a gorgeous, brand new studio which is massive, bright, airy, insulated and built for purpose. You could fit the soap shack inside the studio three times! Although it is not a retail space so I don’t get passing trade every day the amount of space I now have enables me to hold occasional shopping evenings and do workshops once in a while which is really great! I’ve also held pamper evenings and afternoon teas there. If you’d like to keep up to date with events and goings on in the studio plus be the first to hear about new products plus hints and tips please sign up to my VIP mailing list. you’ll get an informative monthly newsletter plus VIP only special offers, competitions and prizes. You can sign up by clicking the link at the top of the website. Thank you for visiting the website. I hope you like what you see. FREE SHIPPING within the UK when you spend £50 or more..